Whether hosted by Ten at the Top or another Upstate organization, over the last eight years I have participated in many events and meetings to discuss various issues that are impacting current and future growth in our region. Most of the time I leave feeling like it was a good use of my time and quality discussion, but knowing that the primary outcome will be more meetings and more discussions as part of a long process to enact change in the Upstate. I had a very different feeling throughout the October 18th Connecting Our Future Kickoff event. Instead of being another event where the general mindset is that we have 20-30 years to strategically address our issues, there was a very different tone and sense of urgency cast by speakers and participants. Whether related to an increase in traffic congestion on many of our roads, growth in previously undeveloped areas, potential disruptive technologies that have the ability to radically change how we think about transportation, that we have jobs going unfilled because we have potential workers who don’t have access to dependable transportation, or perhaps all of the above as well as several other factors, the message throughout the event was very clear, we have to move from discussion to action and do it now. So, the key question is what do we do and how do we do it? According to Carla Bailo, who was our keynote speaker and has been active in efforts to advance transportation and mobility in Columbus, Ohio, one key component is to have a business community that is willing to not only talk about how to move forward, but will also invest in making it happen. Columbus recently received a $40 million Smart Cities grant from USDOT. Through public-private investment they have parlayed that grant into nearly a half a billion dollars in funding and in-kind support that eventually should turn Columbus into a model for using smart technology to move people and goods across a region. In the Upstate, groups like Ten at the Top, the Upstate SC Alliance, Upstate Forever, the Riley Institute at Furman, the Upstate Chamber Coalition and many others have spent the last decade working to cultivate a spirit of collaboration and regionalism as we look at how to tackle major growth issues. In addition, our region is fortunate to have Clemson’s International Center for Automotive Research (CU-ICAR) actively engaged in understanding and developing the future technologies that will forever change mobility. We also have companies including BMW, Michelin and many others who are major players in shaping the transportation future for our country and world. With so many positive assets, it is imperative that we leverage them in a way that positions the Upstate for success around mobility and moving people and goods. For many years, a common mantra in the Upstate has been “we don’t want to be Charlotte and we don’t want to be Atlanta” when talking about sprawling growth, traffic congestion and increased pollution. However, most of our current policies and investments around those issues are actually pushing us in the Charlotte or Atlanta direction instead of towards something else. If we truly want to be a region where all residents can easily and affordably get from place to place and we do not have the negative impacts of sprawling growth and congestion, then we have to decide collectively what we want and how we are going to work together and invest our resources to create a different future. We have many of the ingredients needed, but do we have the willingness amongst our residents, elected officials and business leaders to actually start making different choices and investments towards the future of our region? The Connecting Our Future initiative is designed to help create a vision for what we want as a region and then develop strategies for how to get there. Not every effort needs to be done collectively, in fact future success will require local initiatives and investments. However, if we are all working from the same playbook and moving towards the same goals, then collective success is surely obtainable. What will be critical for the outcomes of Connecting Our Future to truly be impactful in changing the trajectory for future growth in the Upstate is that every stakeholder group must be at the table and willing to play a role in making a difference. It is not someone else’s problem or something someone else will fix for us. The time to impact our collective future is now and it is up to all of us who call the Upstate home to play a role in ensuring that our region is a great place to live, learn, do business and raise a family for generations to come. If you are interested in being involved with Connecting Our Future please contact us through www.connectingourfutureupstatesc.org. Ten at the Top is embarking upon an initiative focused on increasing mobility and connectivity while reducing traffic congestion across the 10-county Upstate, called Connecting Our Future. Born from the Shaping Our Future Growth Scenarios Analysis, Connecting Our Future is an effort to create a regional vision and implementable strategies for transportation, mobility, and connectivity in the region. The effort is being supported by the Connecting Our Future Coalition, made up of stakeholders representing various geographical areas and sectors. A full list of current coalition members can be found on the Connecting Our Future website, www.connectingourfutureupstatesc.org. The initiative will last for roughly a year, resulting in a regional vision document and related strategies for reducing congestion, moving people & freight across the region safely, and improving health and quality of life for Upstate residents by reducing emissions. Results of the initiative will be unveiled in Summer 2018. The initiative will be kicked off with an event on October 18th at the TD Convention Center. The Kick Off event will include breakout sessions focused on various components of connectivity and mobility. The event will wrap up with a keynote luncheon presentation by Carla Bailo, Assistant VP for Mobility Research & Business Development at Ohio State University. Carla helps coordinate Ohio State’s involvement as the primary research partner for Smart Columbus, a $140 million grant program to transform central Ohio into the nation’s premier transportation innovation region. For additional information about the Connecting Our Future initiative and purchase tickets for the October 18th Kick Off Event, please visit www.connectingourfutureupstatesc.org. The American Lung Association has released their 2017 State of the Air rankings and the Upstate South Carolina region is continuing to see the ratings for counties within the region improve. Of the Upstate counties specifically referenced in the report, Abbeville, Anderson, Oconee and Pickens counties received “A” ratings for Ozone; while Greenville, Spartanburg and Cherokee received “B”. This marks the first time that all seven counties have received an A or B rating. In 2016, Spartanburg and Anderson were rated as a “C” and Cherokee a “D”. Dating back to 2012, Spartanburg had received an “F” grade and the rest of the Upstate was rated as a “C”, so the improvement within the region over the last few years has been remarkable and good for the health of all Upstate residents. 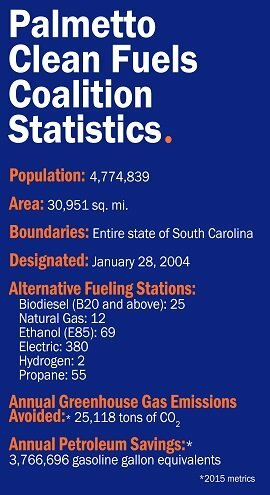 These ratings are consistent with the ozone monitor numbers that are recorded by the South Carolina Department of Health & Environmental Control (DHEC) as part of the EPA Clean Air Act monitoring. The emission numbers in the Upstate have seen steady improvement over the last 15 years and now, for the first time ever, the Upstate region is well within the current EPA attainment standards. Since 2012, Ten at the Top has coordinated the Upstate Air Quality Advisory Committee, which includes public, private and civic stakeholders all focused on ensuring the Upstate’s air quality continues to meet federal standards. Through voluntary efforts of many businesses, local governments and residents, the air quality in the Upstate is continuing to improve. The American Lung Association measures the state of the air by analyzing particle pollution in two different ways: the average annual levels of particle pollution and spikes of short term particle pollution. The levels of ozone and particle pollution are measured at official monitoring sites maintained by the Environmental Protection Agency. To view the American Lung Association State of the Air 2017 report in its entirety please visit www.tenatthetop.org and click on Natural Beauty & Resources. The week of May 1st through May 5th is recognized as Air Quality Awareness Week. This special week provides an opportunity to educate the public on the importance of clean air and simple ways we can improve our air quality. Check out www.CleanAirUpstate.org or the Ten at the Top Facebook page for tips on how to play a role in keeping our air clean and safe for everyone in the Upstate.